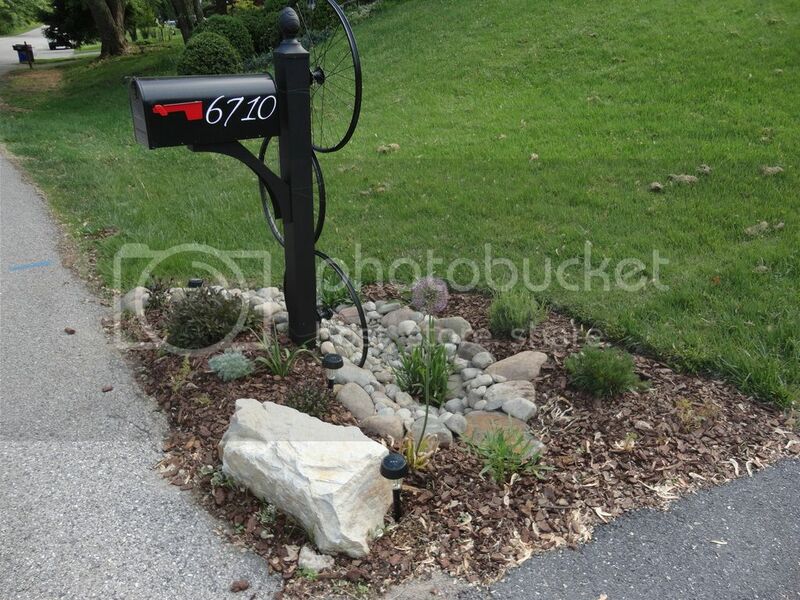 Your mailbox garden is beautiful LeaSmea! So after all my planning some lovely person has plowed their car through it about once a week since early March and my mailbox is currently at about a 45 degree angle and broken I'm pretty sure I know who it is and it's clear they're turning around in our driveway based on the angle of the tracks. Last week they drove about 5 feet into my garden... grrr! Their back tire took out one giant allium and the front tire swiped through the remaining 2 giant alliums. My blood was boiling! As a solution, I have invested in a 150lb rock! It's a beautiful little boulder that should also be functional in protecting my garden. I've also realized that I will have to build a dry river bed since the lowest point has been very soggy so far this Spring. I bought a trellis online but it arrived damaged so I've decided to get creative and make my own trellis. I'll post a photo if it works out. I also think I lost the gardenia over the winter... this poor failure of a garden On a positive note, my lavender has now survived being run over by the car twice now so apparently it was a good hardy choice! -- But whatever you decide, I'm sure it will turn out great! I keep forgetting to take photos applestar! 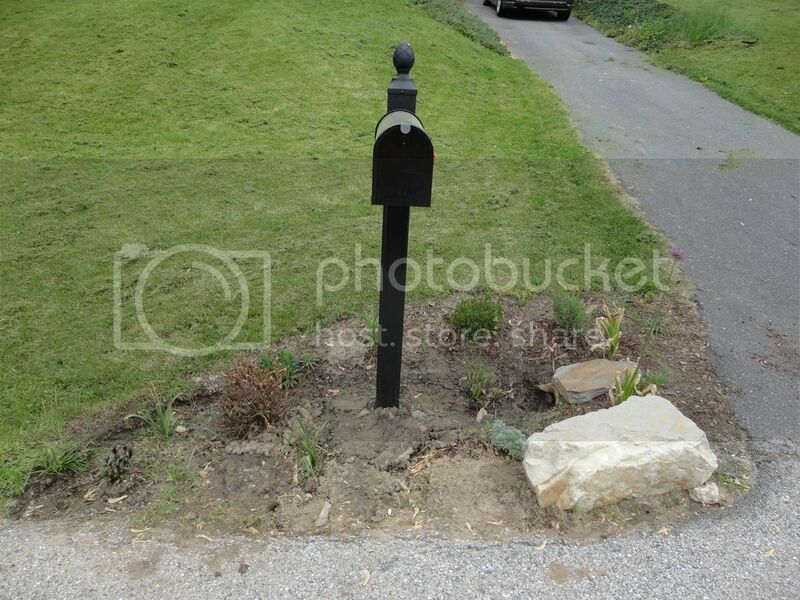 My husband and I replaced the mailbox this weekend so now I'll never have a photo of the poor old slanted one. My next step is the trellis. So here's my trellis plan... My husband and I are both mountain bikers, and he works at a bike shop. He's collecting old wheels for me to stack in a staggered fashion behind the mailbox. 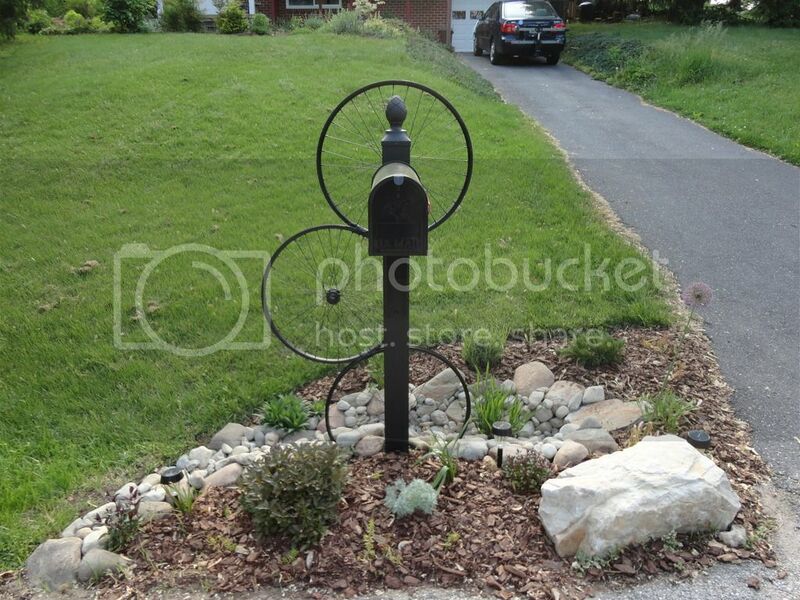 I'm going to spray paint them black to match the mailbox so that it all looks like one piece and still looks classy instead of tacky. I feel like the mailbox garden is the first impression people get when walking by, so I think it will be a fun way to represent us. In case you can't picture it, something like this http://www.kvpermaculture.org/blog/wp-c ... ellis1.jpg only the first wheel would be buried half way and they'd be stacked in a staggered fashion instead of in a row. We have 1 wheel and 2 more to find so that we'll have a total of 3! Once the trellis is installed, the dry river bed will be next! I'll try to take a photo when I get home from work. Sorry to hear about your garden being run over. I think the rock is a good idea. I only have issues with people parking in front of my house and leaving their garbage on my curb or stuck in my hedge. I used to grow mammoth sunflower (only 1) next to my mailbox. It was the best place for it where it did not have competition and it would face east (the road). The only other place I could plant it was in my veggie garden but sunflowers are a bit aleopathic and they don't allow much near their root. It would get about 8 ft tall and it would follow the sun up until about noon, then the head would drop for another day. It was fun to watch. Those were the days before cardinals and bird seed mixes with sunflowers. Today, the birds eat half of my sunflower heads. Thanks for the compliments, I was very excited about it. It's our first home and we've been there less than a year. We put in a brand new mailbox last year since the one that came with the house was literally falling apart due to rot. It brightens up the whole front of the house. 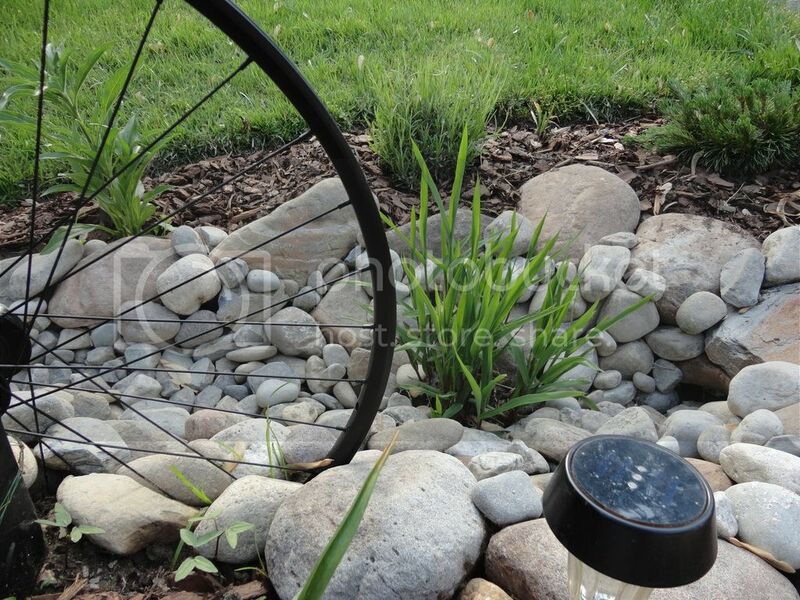 I absolutely love the tire idea! Talk about bringing personality to your gardens. Please post pictures when it is finished! @Applestar, my clematis began blooming! It's gorgeous, however I think I made a rookie mistake and planted it before it was hardened off properly. My leaves are looking quite sunburned. I'm hoping it will bounce back. "If you enjoy the fragrance of a rose, you must accept the thorns which it bears." Your clematis is stunning LeaSmea! Clematis likes the roots to be cool. They love it when their lower parts are shaded by other plants so it will help once those other plants grow up. You may also want to mulch heavily. This will help conserve moisture out by the mailbox area (typically not and sunny) too. 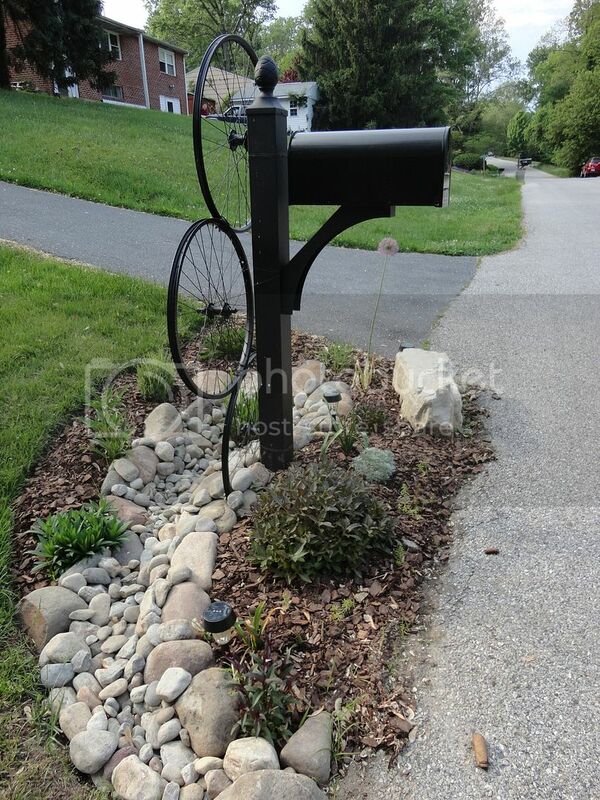 The mailbox garden is officially complete! I'm waiting for a good rain to wash off all the rocks in the dry river bed before I take photos but I promise to actually post photos. I did finally end up taking some pre-trellis and rock photos so I'll post those as well. It's a total hodge podge but I'm really happy with how it turned out. The silver leaves of the lavender and artemesia are a nice contrast to the dark leaves of the penstemon, guara, and weigela. 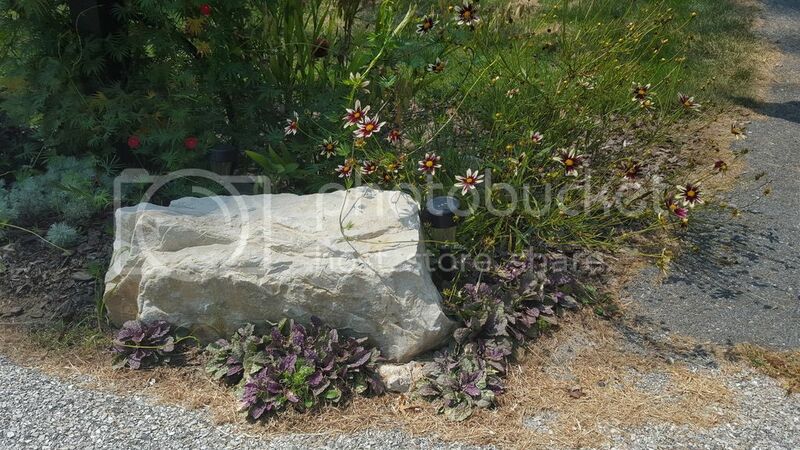 The variegated ajuga has both the silver color and purple/burgandy shade together and the angelina sedum is planted throughout for a nice bright contrast. I can't wait for everything to fill in! I ended up having to swap around half of the plants because they didn't work spatially once the rocks were in place but it seems to have come together... I promise that photos are to follow!!! Sounds wonderful, can't wait for the pics. : ) Several of those plants were new to me so I googled them and now have more to add to my list of things to plant. See the baby Cardinal vine seedling growing at the bottom of the trellis? @Applestar - Do you think the Northern Sea Oats will be problematic there? I didn't even think it had made it because it took a while to show up and then got run over and crushed into the mud. I just didn't have the heart to move it since it looked nice peaking out of the stone. Will it go nuts there? That is so great! I am not very artistic but what you added made it all come together. Thanks Sweetiepie! 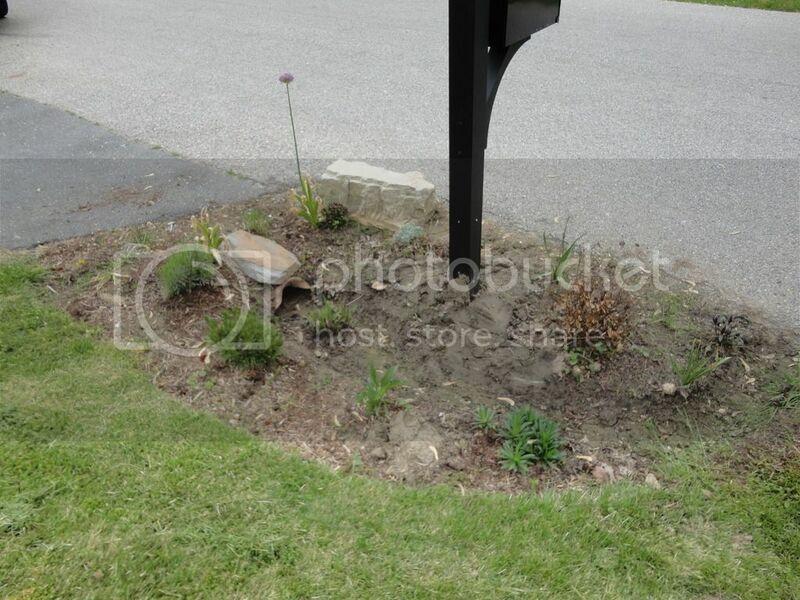 I wish I'd taken before pictures when I had the old mailbox and just grass and again after the mailbox got plowed over just so you could see the full progression. Oh well! I'll try to remember to post photos at the end of the season when everything has filled in and recovered from being transplanted and/or run over! Well, the season is winding down and I figured I'd post an update. The ajuga has thrived in this difficult spot between the street and boulder. and I'm in love with this coreopsis! I got it on clearance and didn't know what color it would be so this was a beautiful surprise. It has bloomed non-stop since maybe July. Any ideas as to the variety? 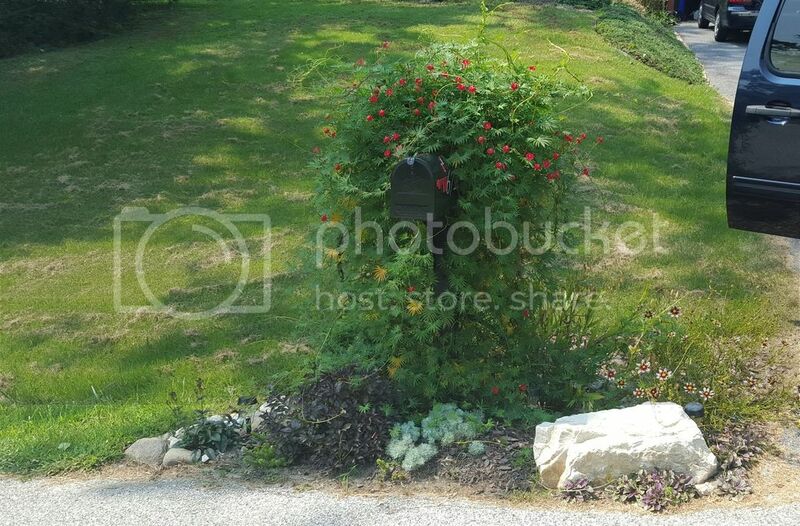 If your wanting a climbing type flower/vine for your mailbox "Confederate Jasmine" does really good in dry soil in direct sun light and growers quick!!! Or there are several other Jasmine a pink color flower can't think of the name. I live in Alabama and the jasmines take the heat and drought like conditions very well.